The Almost Abandoned Attic is down! Since Neopets transitioned to new servers in September 2014, the Almost Abandoned Attic has not restocked. We do not know when it will return. Located in a mysterious house in Neovia, the Almost Abandoned Attic is only open to those with accounts over 3 years old. If you're one of those people, congratulations! The Attic is essentially the Igloo Garage Sale on steroids. Why? Because only items of rarity 80 to 99 are stocked in the shop; which includes many user's favourite types of items: morphing potions and Draik Eggs! Like the Kadoatery, the Almost Abandoned Attic restocks at a time interval which in this case is about every 7 minutes. If the Attic does not restock at the time when it is predicted to, you'll have to try again at the next 7 minute interval. Also, be sure to move quickly, as items move in literally seconds, especially with such big ticket items stocking there. For those of you who wish to access the Almost Abandoned Attic from the Neovia map, you just need to click on the door highlighted below. Let's take a closer look at what an attic restock looks like, shall we? The items that restock here are between rarity 80 and 99 and are chosen completely at random. If you're lucky, you can find super rare items at the attic, but you'll have to be lightning fast! Of course, there's no haggling of any kind here, so the first second or two are the deciding moments. Each time the attic restocks, it will stock to 24 different items. Just as you'd expect, r99 items seldom restock. Yet, on the rare occasion a r99 does restock, there are often multiple r99s in that restock! Items are sorted in order of ID number, so older items appear in the top row; newer items in the bottom row. Items in the Attic are priced at whatever the "Est. Value" is according to the item information when you click on it. This is usually notably lower than the actual market value of the item, but there are of course exceptions. 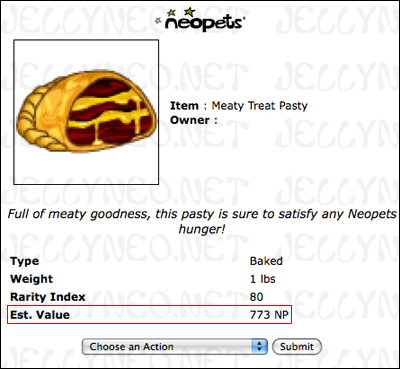 This Meaty Treat Pasty restocked for 773 NP, but sold for much more at the time. Nothing is without limits, and the Attic is no different. There are 3 ways you can get banned while Attic restocking. First off, you can only buy 5 items per day. Once you've reached the limit, you will receive the error message below and will be unable to see any restocks. Second, you can now get banned simply by refreshing too much, just like restocking in the Neopian shops. Unfortunately, these bans do not reset at midnight, and there's no way to predict how long they'll last. These bans can last for a mere few hours, and sometimes as long as 18 to 24 hours. On some occasions, bans lasts for less than an hour, but if you start refreshing several times, you'll immediately get slapped with another ban. In this case it can be more beneficial to wait it out rather than pushing your refreshes to the limit. You can only make a purchase every 15 minutes. If you try to buy an item during a buy ban, the poor old shopkeeper will yell at you, and you'll end up empty-handed! JN first discovered that the Attic always has the same potential restock times during a weekday; for example, Sunday always has the same RS times, Monday always has the same RS times, etc. As of August 2013, TNT adjusted the attic times to throw a little more randomness in the mix, meaning that the times no longer follow a set schedule. Fortunately, we've discovered its latest trend. Don't forget to keep track of seconds when tracking the times--they matter! It's important to note how much time has passed since the last restock. If the Attic hasn't stocked for a long period of time, such as an hour or more, the next restock time will be harder to predict. By the time the restock happens, the restock time would have shifted considerably, and can restock to even a minute later than anticipated. To avoid missing the restock in these circumstances, it helps to keep refreshing a minute or two past the projected time. The Attic will NOT restock during every single 7 minute interval. It has been known to restock several times in a row, as well as to go several hours without a single restock. The less scrolling, the better! For best results, be sure you can see all of the items at once! Refreshing-induced bans can last anywhere from a few hours to 18 hours or more, so use those refreshes wisely. If you're deliberating which item to click on, chances are they're already gone! Remember that unprofitable items stock too, so don't just click items that look nice! If you're aiming for big profits, it might be worth it to skip out on a purchase if the restock isn't as grand as you hoped, but you take the chance of the next restocks bringing worse outcomes! Study our complete list of Attic items to get an idea of what's profitable and what's not!